Fake businesses are to be used to lessen the impact of the recession on high streets in North Tyneside. With 140 empty shops in the borough, council bosses think they have come up with a unique way of ensuring shopping areas remain as vibrant as possible. The first empty shop unit to be given a makeover with a "flat pack" shop front is in Whitley Bay. North Tyneside Council said the move was cost-effective and would help to attract new investment. 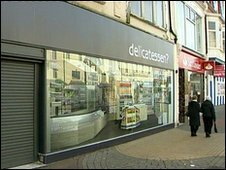 The council said the fake shop in Whitley Bay - which alone has 49 empty units - has been welcomed by traders and shoppers. Judith Wallace, North Tyneside Council's deputy mayor said: "The economic climate has forced many businesses to bring down the shutters. "We need to ensure that the remaining businesses continue to survive and that means ensuring our high streets look attractive to both shoppers and potential business investors. "This is a simple and cost-effective approach that keeps the retail unit available for potential new uses and in the meantime also contributes to the street scene." Empty shops in Wallsend and North Shields are now being earmarked for similar treatment, which costs about £1,500 a time. The government-funded project involves colourful graphic designs featuring a range of different shop types, which are either taped inside the windows or screwed to the fascia so they can be removed and reused as required. Karen Goldfinch, chair of Whitley Bay Chamber of Trade, said: "It's an excellent way of promoting how a unit can be used, perhaps inspiring new businesses to come into the town."